Don't dismiss this theory on the grounds that the electromagnetic fieldproduced by a moving charge is many times smaller than the electrostaticforces produced by the same charge. Or calculate on the basis of large pointcharges. In a gas, the forces apply to a single molecule or a single electron.There is no aggregation of charge. Read right through, and assess whetherthis theory accounts for the points made by observation of tornadoes. This theory proposes that the tornado forms from the rotation (round a vertical axis) of a large volume of cloud which carries an electricalcharge. Such rotation has been measured in many clouds using doplar radar, and the rotation of clouds prior to the formation of tornadoes has been filmed. The electrons that give such a cloud a charge are attached to molecules of N2 or O2 or water vapour. Only a small proprtion of these air molecules will carry this excess charge. The majority of molecules will be electrically neutral. The molecules in a cloud of gas are moving randomly in all directions in proportion to their temperature, and near collisions between these molecules give rise to the gas pressure. The charge particles will similarly be carried in all directions. In a rotating cloud, there is an overall flow of these molecules in the direction of rotation, which is the net flow of this random movement of molecules in the direction of rotating. We cannot therefore consider the effects produced by these molecules, as being molecules moving in parallel - because they are not. We can compare the net result of these molecules random movements against the net results of the random movements of all the molecules in the cloud. Each moving charge will create an electromagnetic field round itself. The sum of the magnetic field produced by the random movements in the direction of rotation will produce a solenoidal magnetic field round the verticalaxis of rotation. The electrostatic charge on each charged molecule will repel others, but in a large charge cloud this will be approximately the same in all directions. Electrostatic charge between charged molecules can cause increased separation of these molecules - an electrostatic pressure - that opposes the surrounding air pressure. This electrostatic pressure causes a slight decrease in density in the the charge cloud, but it is otherwise stable. The electrostatic pressure can be balanced by the air pressure, so that the charge cloud does not fly apart under mutual repulsion of charge. In a cloud that has an electrostatic gradient, neutral molecules form dipoles that experience a force that attracts them towards a point of increasedcharge. 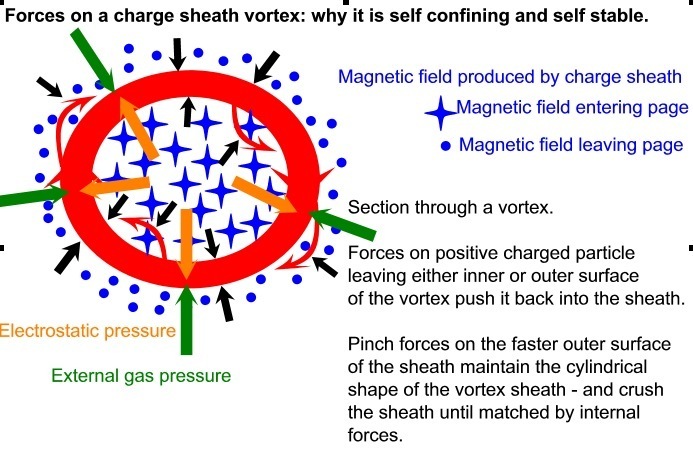 Development of these forces within a rotating charged cloud. Assume the cloud is initially rotating round a vertical axis, and the excess charge is uniformly distributed. The electrostatic pressure is the same in all directions, and has not net force on a charged particle. The net flow of the charged particles round the vertical axis will produce a small electromagnetic field shaped as a solenoid round the vertical axis. As charged molecules follow their random paths in this circulation, there will be a small net force inwards as they move through the electromagnetic field of the solenoid. This small net force inwards will result in a small increase in pressure inwards. As molecules collide in this circulation, there will be a small inwards force on the charge, pushing the charge inwards. These small forces will result in the transfer inwards of a small amount of rotational energy from the kinetic movement of these molecules. This will be observed as a small acceleration of the rotational velocity ofthe charge cloud towards the center of rotation, through conservation ofrotational energy. Continued development of the rotating charge cloud. Charge is now slightly greater towards the centre of rotation. Electrostatic pressure is now greater towards the centre of rotation, but as these molecules move further apart through electrostatic pressure, the kinetic component of air pressure reduces to match: The net pressureforces on these molecules remains the same. The increased net flow of the charged particles round the vertical axis produces an increased electromagnetic field. The increased density of charged particles in the faster circulation produces an increased electromagnetic field. The aerodynamic forces at work in a faster moving airflow reduce its internal pressure. The increase in charge towards the centre of rotation now results in an electrostatic charge gradient from the centre outwards. The neutral molecules in the rotating cloud now form dipoles that experience a net attraction towards the center. These now contribute to the inwards force and the transfer of rotational energy inwards. Positive feedback results in increased electromagnetic fields, increased charge transfer inwards, increased rotational velocity of a smaller core. Equilibrium state for the rotating cloud. The maximum charge density that can be sustained by this mechanism is when the electrostatic pressure in the rotating vortex is matched bythe external air pressure. The vortex sheath can still grow in thickness as more charge molecules are added to it. Electrostatic pressure will be reduced in a fast movingcharge cloud for the same reason that air pressure is reduced in a fastmoving air flow - the same forces are involved. The maximum charge gradient in the charge cloud that can be sustained is when the electromagnetic force pushing the charge inwards is matchedby the electrostatic force pushing the charge outwards. This central vortex is still too weak, and lacks the coherency thatI think we are observing in the tornado's vortex tube. I am proposing that another mechanism is involved as the electron densityincreases in the rotating centre of the cloud. As charged molecules collide in the rotating airstream some electronsare knocked free, and in the magnetic field of the solenoid of the rotatingcloud, these electrons will continue to travel in the same direction beforecolliding with another air molecule. These free electrons travel briefly at speeds closer to 1000000 m/s.A cascade of free electrons produces an electromagnetic field that contributesto the soleoidal field of the vortex tube and intensifies it. The electromagnetic field now produced by the rotating sheath is nowsufficient to hold all the electrons against the repulsion that would beexpected if the average rotational speed of the electrons was the same asthe airflow. The vortex tube created should be the same charge as the charge cloud that produced it. It should be rotating in the same direction as the charge cloud. The high charge in the vortex tube is held in place - from flying outwards by the electromagnetic field it creates, and air pressure, and hydrodynamicforces which create a stable vortex. because the electromagnetic field produced by opposite walls of the tube oppose each other, this prevents the tube from collapsing. This theory has proposed that the tornado tube is highly electrostatically charged, and the opposing aerodynamic forces, electrostatic forces and electromagnetic field, together produce a vortex tube with considerable shearstrength. The charged vortex sheath bites into the ground rather like a holecutter. A tubular narrow blade rotating at high speed moving over theground surface. Because the electromagnetic field is solenoidal, it can be intenseinside the tube, but very small outside the tube. To measure it you needinstruments underneath the vortex path itself. 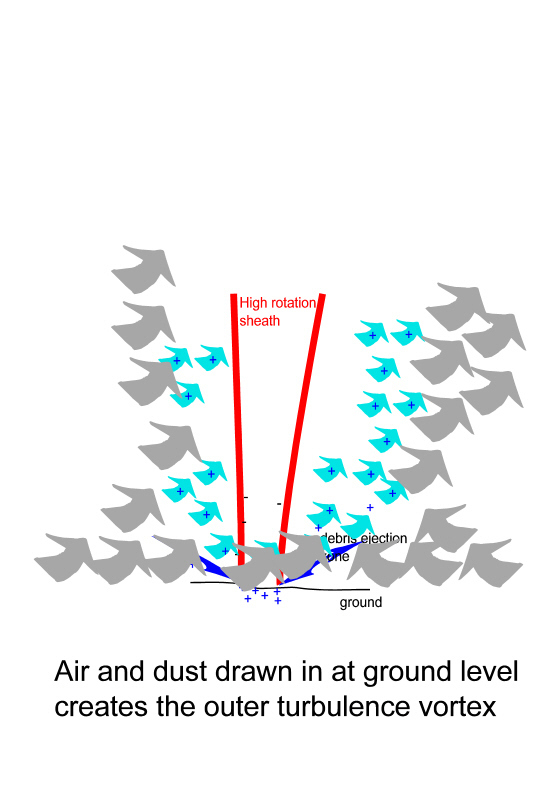 The result is a turbulence vortex of dust and air rising, surrounding the charged sheath vortex of the tornado at its centre. When we watch a large tornado, what we see is the rising turbulence vortex of dust and debris, but at its core it is powered by a charged sheath vortex of extreme ferocity and strength. From https://www.kwtv.com/wx/wxcenter.htm is tornado2.mov(389K) A or tornado2.mov from cache A huge tornado, but most of what we can see are hanging plumes of ejected material, in a gently rising and gently rotating air stream. The violence of the charged sheath at the core is not visible. When we examine the debris field after the tornado has passed, the broadest part is a band of destruction caused by the inflowing winds of the turbulence vortex, but at the core is a narrow band that has felt the teeth of the charged sheath itself and the ground surface shows the striations as the surface was pulled apart. Small debris such as straw can become entrained in the charged sheath and then behaves as though it was part of a rigid solid, driving the debris through wood orsteel. The charged sheath can also rip and twist metal structures under theground surface protected from any wind, but fully exposed to the violent magnetic fields at the end of the vortex tube. You are welcome to join the discussion, but please note that any claims you make for or against these theories should be backed by scientificreasoning that can be developed from first principles.